My girlfriend recently told me I needed to be careful about using words like “meditation” and “mindfulness” when talking to lawyers. She said this after reading a draft of my post from a couple of weeks ago about finding time to be still, suggesting that concepts like meditation can be really off-putting for attorneys. And (as much as I hate to admit it) I am afraid she may be right. Many of us who practice in a profession that requires perpetually feeding a voice in our head so we can present as confident and in control, find phrases like “sacred space” and “quieting the mind” a little weird–as Dan Harris suggests, “the exclusive province of bearded swamis, unwashed hippies, and fans of John Tesh music.” So, whenever we hear someone talk about practices like meditation our eyes glaze over, we stop reading and turn the page to peruse something a little less New Agey. That’s really a problem. Because of all the people and professions in the world, lawyers may be the ones most in need of what practices like meditation can offer. The challenge is finding ways to talk about it without turning off those who most need to hear it. 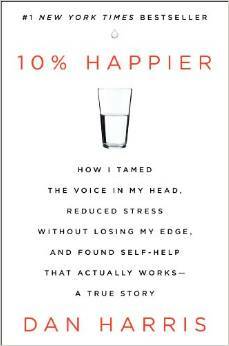 That’s what Harris tries to do in his recent book, 10% Happier: How I Tamed the Voice in My Head, Reduced Stress Without Losing My Edge, and Found Self Help That Actually Works. Harris is an ABC news correspondent and as such earns his living in the pressure cooker world of broadcast news. There are some similarities between what he’s called to do as a broadcaster and what we are asked to do as lawyers. The most notable of which is that both professions require that we present a certain image to to viewers, clients, courts or colleagues. And as such, people in both professions struggle with the imbalance between the image we present to the world and our own interior psychic landscape. It is that imbalance that meditation helps us correct. And it’s able to do this because it is profoundly effective at helping us deal with the voices in our heads…and ultimately enabling us to envision a way of living that is not controlled by those voices. What’s appealing about this book is that Harris is someone who earns his living in a hard-charging, very competitive profession. And he, like my girlfriend, is a skeptic around any New Age lingo. But he finds a way to talk about some important practices in a way that is attractive to smart, ambitious and cynical people. This week drink one less vodka martini and spend the money you save on downloading Harris’ book to your Kindle. Maybe you’ll find some new ways to think about things like meditation. Better yet, perhaps you’ll discover that what’s really weird, is believing that all of that stuff the voices in your head are telling you is really true. May want to check out http://www.headspace.com – very helpful way to get started with meditation.